Jasper’s got his eye back, but looks like he’s still grumpy at that girl. Speaking of which, she still hasn’t been named yet. I am just now realizing this as I write it. Hopefully proper introductions will be forthcoming (eventually). Even more hopefully is I’ll get more practice drawing people. Hoo boy. When I started this comic, part of the reason the main characters are blobs is that I asked myself, what could I easily and quickly draw over and over. I’m trying to teach myself more humany type stuff as I go, but even still this new girl character has been a real challenge. 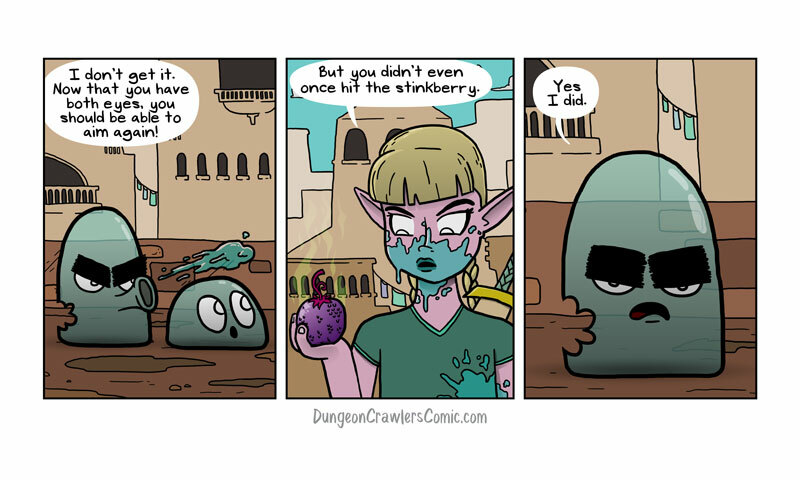 The next two comics are going to be short little three strips like this one, and then we will be on our 100th comic! Crazy I know. I think you have done an excellent job so far.